Dark ambient, neoclassical, dark wave, Gothic, orchestral, symphonic, “soundtracks for the imagination”… It doesn’t matter how you want to categorize or describe Midnight Syndicate’s music. What matters is whether you’re a fan of fantasy & horror because if you can’t check off those boxes then the music of Midnight Syndicate is not for you. Based out of Ohio and founded in 1996 by composer/filmmaker Edward Douglas, Midnight Syndicate basically creates what I would describe as soundtracks or scores for horror/thriller/mystery movies that don’t exist (and some that do). They’ve also done an officially licensed soundtrack for the Dungeons & Dragons role-playing game. The group’s music is mostly instrumental with the rare occurrence of a voice or sound effects being used. Some songs are big and bombastic while others a low-key and haunting. 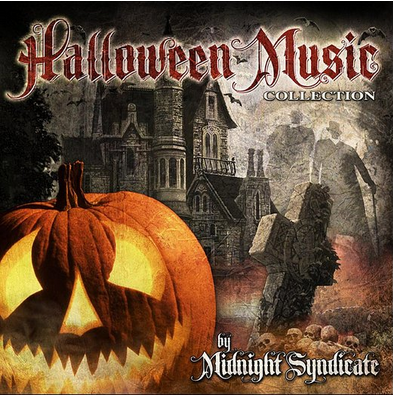 Halloween Music Collection is exactly what the title implies — a collection of music for use during the Halloween season. Specifically, this a compilation album that pulls songs from the group’s past efforts. Those songs were specially remixed by the group for this compilation. As a starting point and introduction to the group, you can’t find a better album than this. This album sets the exact tone I want during the Halloween season. Even though I live in the Florida heat, this eerie collection of music whisks me away to a place that actually gets cool autumn weather where I imagine a cool breeze on a dreary day and having a nice seasonal-scented candle (pumpkin!) lit. Each song here conjures up an image whether it be some psycho-killer stalking through a forest, a creaky old dark house, the Phantom of the Opera, some cult about to offer a sacrifice, Hammer horror or a graveyard filled with fog. Halloween Music Collection is the perfect Halloween soundtrack to play while having a Halloween get-together or on an evening when you feel like you need an injection of the Halloween spirit. For added spookiness, try listening to this album when you’re alone! This album is definitely a new standard for me when it comes to the Halloween season.